SANTA ANA, Calif., January 29, 2019 – Alliance of Channel Women (ACW), a not-for-profit organization dedicated to accelerating the growth of female leaders in the technology channel, announced changes to its leadership team for 2019, including the expansion of its Board of Directors, the election of four new directors and the appointment of new officers. 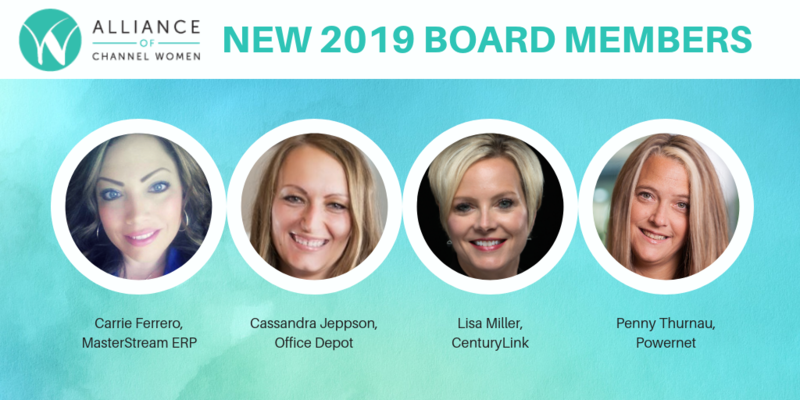 These directors join Conrad and ACW’s continuing board members, including Rebecca Rosen, Vice President of Marketing for Broadvoice; Raquel Wiley, Senior Channel Marketing Manager for TPx; Amy Bailey, Vice President of Marketing for Telarus; and Michelle Kadlacek, Vice President of the Enterprise Partner Program at Spectrum. Conrad and Rosen continue in their roles as President and Vice President. Wiley and Jeppson will take on new roles as Treasurer and Secretary, respectively. Helene Kidary, Vice President of Channel Sales for OnSIP, and Shaquille Fontenot, Director of Marketing at CNSG, are leaving the board. Kidary served on the ACW board for three years, one as secretary, and three years as Chair of Membership. She remains an active part of the organization as Co-chair of the Technology Committee. Fontenot has been a rising star in the organization and has served as Chair and Co-Chair of the Communications Committee as well as a member of the Newsletter and Event Planning committees. ACW stands by the principle of rotating leadership not only to bring new thought leaders to the group but to provide leadership opportunities to as many members as possible. In addition to the Board of Directors, nearly 100 ACW members serve on operational committees that drive the organization. For information about ACW membership or committees, visit ACW online at www.allianceofchannelwomen.org.